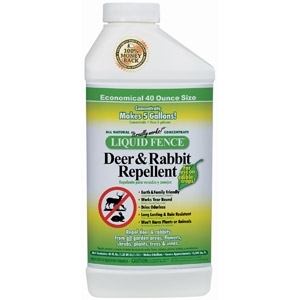 All natural, long lasting Liquid Fence® Deer & Rabbit Repellent will stop deer and rabbits from eating your flowers, shrubs, trees, grass and vines. And rest assured, it won’t harm your plants or animals! It’s so effective, we back it up with a written 100% money back guarantee. 40 oz.